Brussels Airport has officially opened its new Connector building. 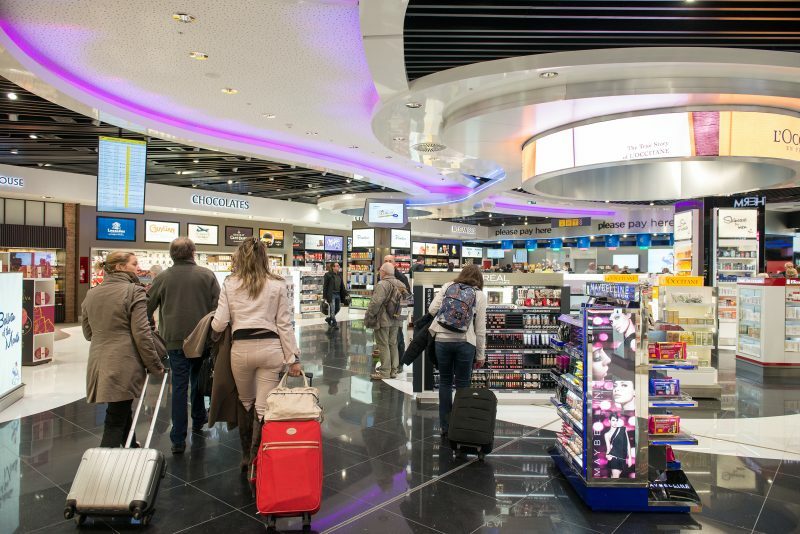 Brussels Airport has built Connector, a 75 million-euro investment, to increase passenger comfort and improve the retail experience for travellers. The Connector building at Brussels Airport links the terminal above-ground to the two piers so passengers need less time to go from the check-in to their boarding gate. Passengers can now wait to board their plane in an open and airy building that besides a spectacular view of the airfield offers a contemporary mix of shops and restaurants. 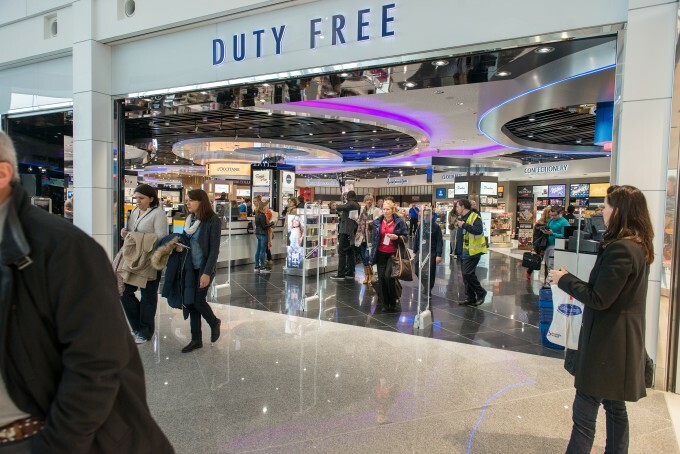 Four years after project was launched and two years after the start of the construction works, Connector – the new beating heart of the airport – opens its doors. Connector is the most important investment at the airport since the construction of Pier A in 2002. “Connector is the emblem of the strategy we adopted in 2012 and which places the passenger at the centre of everything we do. Because the first and foremost purpose of Connector is to further improve the quality of the airport infrastructure for our passengers and airlines”, says Arnaud Feist, CEO of Brussels Airport Company. 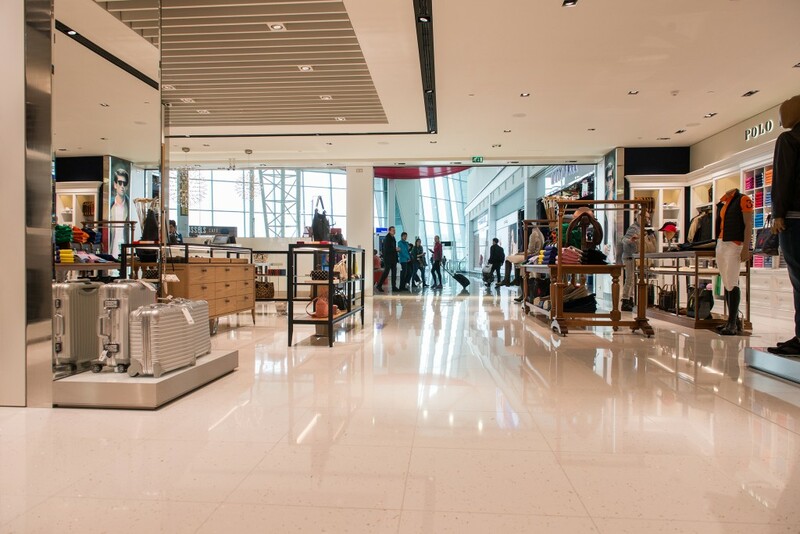 Stylish shopping environment: Immediately after security, the passenger enters a brand-new shopping environment. A wide boulevard leads you through a large walk-through shop, with a variety of retail outlets on either side. This shop is the biggest fragrance and cosmetics shop in Belgium, but you can buy fashion and accessories, jewellery and watches here as well. If you’d like to take a piece of Belgium with you on your journey, this is also the place to buy Belgian specialities like beer and chocolate. The Belgian Chocolate House sells the premium Belgian brands, such as Godiva, Neuhaus and Corné Port-Royal, especially for travellers, at the lowest prices. 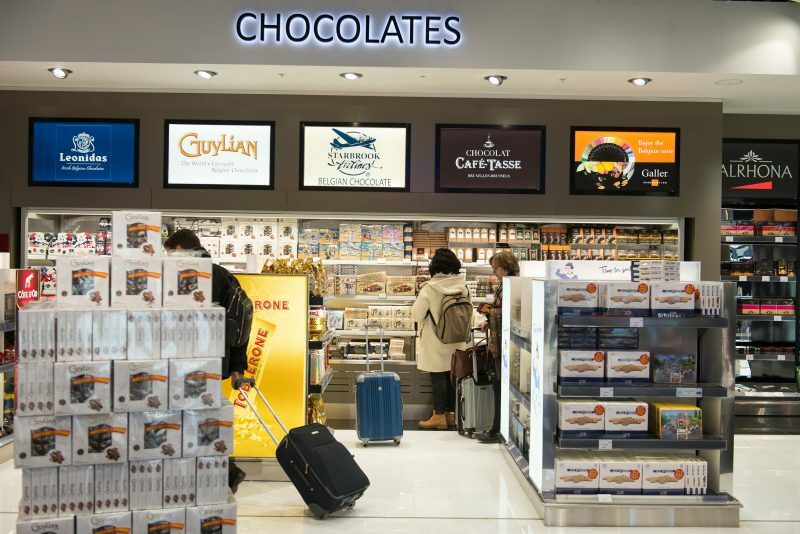 More chocolate is sold at Brussels Airport than anywhere else. No less than 815 tonnes of it are handed over the counter every year. That’s 93 kilos an hour, making Brussels Airport the biggest chocolate shop in the world! Maybe you’re looking for luxury fashion brands instead? 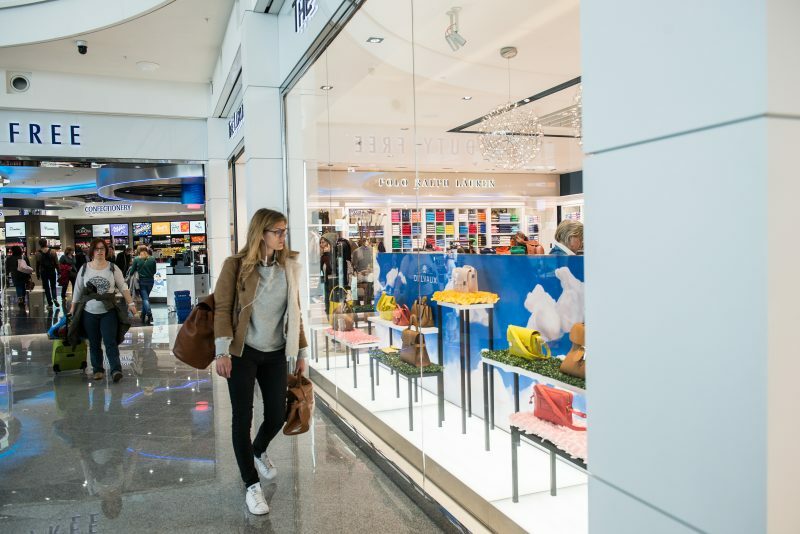 Connector offers a contemporary mix, including Hugo Boss, Longchamp, Tumi, Ralph Lauren, Zegna, Ferragamo and Delvaux, at duty free prices. Which means there’s nowhere cheaper in Belgium to buy them than at the airport. Or discover the Victoria’s Secret and Coach stores – the airport is the only place you’ll find them in the country. The shops also offer an extensive range of quality brands like Tommy Hilfiger, Michael Kors, Desigual, Mc Gregor, Sarah Pacini, River Woods and Massimo Dutti. The airport will also introduce a number of new concept stores. These include a children’s store with brands such as Armani and Burberry in small sizes, plus toys and souvenirs from brands such as Tintin (from Belgium), Lego, Disney and Barbie. Other concepts include the award-winning Epicure, featuring luxury food, wines, tea and coffee. Better service and increased comfort: Connector links the terminal above-ground to the piers and is built to meet the expectations of our passengers and partners in terms of comfort, accessibility and travel experience. 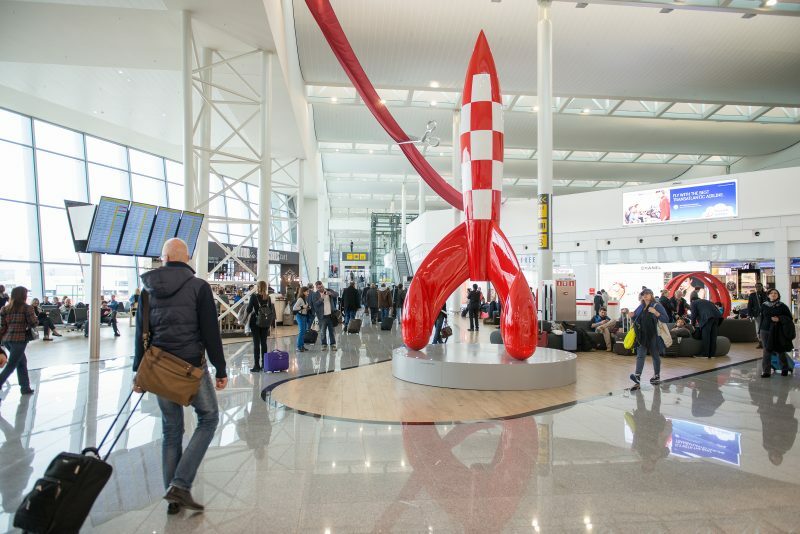 With Connector Brussels Airport intends to offer its passengers a better service and an entirely new airport experience. The itinerary from check-in to their gate in Pier A is now totally different. Passengers who depart from gates B will start using Connector as from early next year. Thanks to Connector, passengers will take only 5 to 10 minutes getting to their boarding gate from check-in. No more need to descend below tarmac level and more importantly, no more need to take the long, dark tunnel. The passenger stays above-ground in an open and airy building where they enjoy a magnificent view of the airfield. Contemporary, clever design: Putting up a building at the heart of a busy airport was not an easy feat. During its construction we had to take account of the existing tunnel which had to remain fully operational at all times. The façades on the east and west side had to slope slightly outwards so as not to reflect radar beams from Belgocontrol or radio navigation signals from aircraft. Moreover the construction had to be jet blast resistant. When designing the building the architects chose to use as much glass as possible to allow natural light to flood in and give passengers the opportunity to enjoy the activities on the tarmac.